You might have snails to blame for the white dots on your aquarium glass. Don't panic: those white specks that have taken a liking to the glass of your aquarium don't indicate some bizarre fish disease that's going to wipe out your precious aquarium inhabitants. But the specks may be predators or freeloading snails that you might want to get rid of. If you have snails cruising along in your tank, chances are pretty good that you're seeing snail eggs attached to your glass. Even snails that cannot reproduce in freshwater, such as and especially nerite snails, lay eggs (except livebearers). Eggs often appear on plants and driftwood as well. Lean in for a good look at the dots or hover over them with a magnifying glass. If you notice the white dots are inside what appears like a transparent shell, you most likely have snail eggs. The eggs stick to your glass like glue, and you'll likely need a razor blade to remove them. Your fish will help out by eating the eggs. While some snails are in no way tiny nor white, others are and often affix themselves to your glass. They're typically either round or conical, and they're often on the move, never sticking around in one spot for too long. In freshwater tanks the snails are typically babies of other snails. 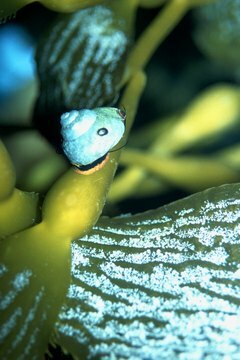 In saltwater tanks you're probably dealing with stomatella or collonista snails, both of which are harmless. Freshwater baby snails, in contrast, typically lead to an overwhelming number of snails that contribute too much waste and may eat live plants. Removing them entirely is impossible, but you can regularly remove them by laying a piece of lettuce at the top of your tank for a few hours and then taking it out. The snails will cling to the lettuce. Hydra are pests that you don't want living in your tank. They're unfriendly little creatures, preying on tiny fish, fry and small shrimp. When viewed most angles outside your tank, hydras look like small white specks seemingly glued to the glass. But take a closer look. If the specks are indeed hydra, you'll notice they have an elongated body and long tentacles. Their tentacles often move with the current of your water. The best strategy for removing hydra is the same as preventing them: avoid overfeeding your fish. You may also want to look into adding a blue gourami—no more than one—to your tank, as they feast on hydra. Lots of other organisms take on a white appearance and plant themselves on your glass, but the vast majority of them are not harmful. Examples include flatworms, copepods and feather dusters. A particular species of flatworm that many fish hobbyists encounter is planaria. While usually not harmful to your fish, they can overwhelm your tank and they're an indicator of overfeeding and dirty substrate. Planaria have flat, wormlike bodies. You can see them on your glass and when you stir up your substrate. Vacuum the gravel and change out 20 percent of your water once a week and avoid overfeeding to remove the unsightly creatures.